Record of Health was designed for children to record bodily measurements, and covered topics of health such as fresh air, sunshine, food, clothing, exercise, rest, sleep. The food advice given is combined with basic anatomical functions. 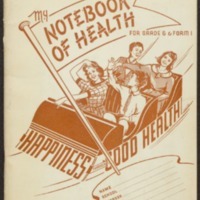 Unlike other notebooks the focused on health alone, the goal was for primary school children to achieve happiness through good health, reflecting a move away from health being confined to the body. The recording of body measurements is still a part of school programs today. 70 pages :illustrations ; 25 cm.